Join us at Cite des Arts for the play “AWC” written by Charles Manns and directed by Sheryl Ned. The production is staged and performed by Lafayette Live Radio Theatre reminiscent of ole' time radio plays with a multimedia twist. 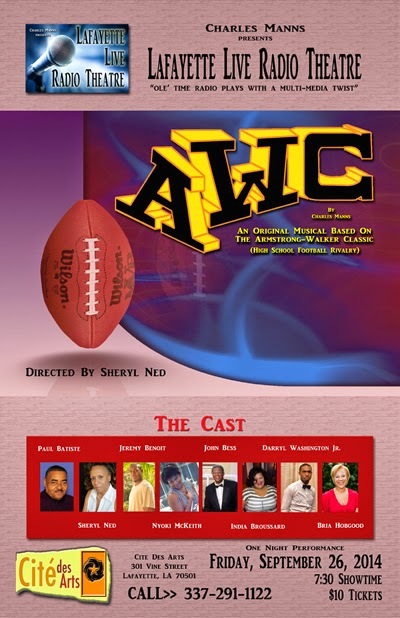 "AWC" is an original musical based on the Armstrong vs Walker high school football game rivalry. This is a story about three teenage kids name Allan Wright, Wayne Carter and Cynthia Anderson. They have been friends for as long as they can remember. Though they are not related, they have known each other all their lives. They have lived in the same neighborhood, gone to the same church, same school and same playground together forever. In so many ways they are as close to each other as only brothers and sisters would be. They like the same stuff and they always stick up for each other. But now, for the first time, they find themselves faced with an unbelievable strain on their friendship. Something that they did not think was possible. One night performance, Friday September 26 @ 7:30 pm. You may purchase tickets online at our website www.citedesarts.org, or call to make a reservation 337-291-1122.